It’s no secret I love gadgets and technology, and products from Apple in particular. I’ve been a user and fan for as long as I can remember. But as great as gadgets and technology are, they’re not without problems. They can’t all be great, can they? No. Some are crap for sure. Many of these devices or gadgets break, need updates or whatever at often the exact time you need them to work, which leaves you with no way to get done what you need to get done. Apple, at least, seems to do a pretty good job of putting out tech people want and products that, as they say, “just work.” But they’re not perfect either. The truth is, no piece of technology is perfect and it may never be. I know. I’ve already said a lot of pro-Apple stuff here. But don’t worry, this isn’t going to be a pro-Apple or anti-technology article. I also won’t try to get you to switch to a Mac or iPhone. But I do have a few positive things to say on a related subject. Put simply, I’ve re-discovered the joys of analog. Even as a long-time tech devotee, I’ve always used analog tools too. I believe they can co-exhist and compliment each other. I’ve written blog posts, articles, screenplays and more using a computer for many years, but I’ve always put things down on paper, in a notebook, using a pen or pencil first before I start banging away on the keyboard. I’ve got notebooks full of the stuff in boxes. Recently, I was going through them in an effort to organize my office (after all, we did move almost two years ago so it’s past due), and I discovered something: I missed them. I missed my notebooks, my pens, my pencils and my paper. The sad fact is I haven’t been writing much of anything lately. Being a father who stays home most of the time with a toddler has a tendency to stifle your creative flow. In a lot of instances I’d rather be catching up on sleep instead of doing any writing. But that’s not all of it. There’s a lot of reasons not to do something and I’ve been good at finding most of them. Sometimes you just get into a slump. Consequently, I haven’t been writing much or using my analog tools. I’m going to embrace the analog and go back to my notebooks, pens and pencils. The spark, actually, was my return to film photography. It got me thinking. Then, going through my office I found the cache of pens, pencils and the notebooks I had spent years filling up. That was the rest of the inspiration I needed. So, to kick things off, I’m starting a new journal project. 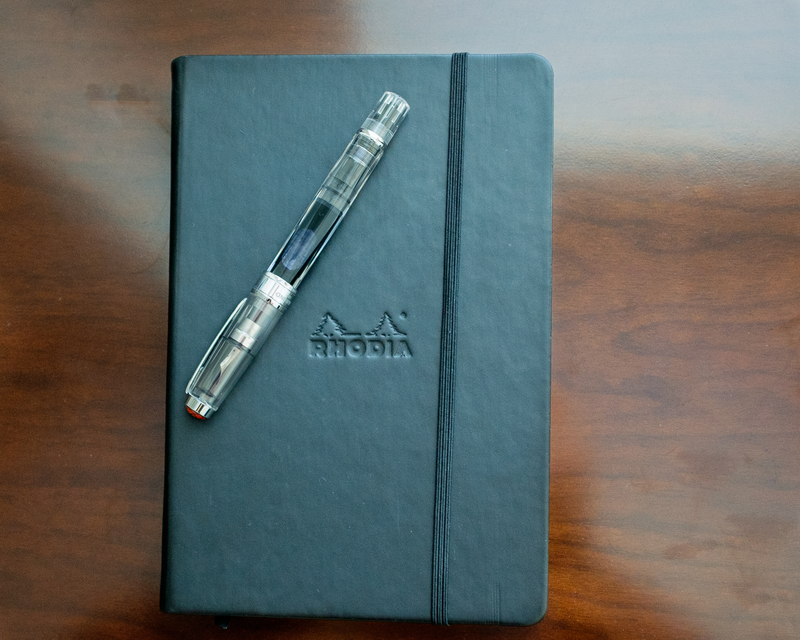 My notebook of choice will be the Rhodia Webnotebook , which I will write in daily. To accompany said journal, it’s into the fountain pen and pencil drawer I go to retrieve my old friends the TWSBI Diamond 580AL and the Blackwing 602 . I may bring other pens and pencils on this journey with me, but those two will be the main companions. To help get the word flow started, I’ve decided to adopt this simple plan highlighted in an article I recently read. Unfortunately, I forgot to bookmark the link and now can’t give credit where credit is due. I wish I could. If I find it, I’ll update this post. Or, if any of you know the origin, feel free to let me know in the comments so I can credit it. The approach is simple. Ask yourself three questions in your journal every day. If you answer them, even in a few sentences, you will at the very least be writing every day. What I’ve discovered is if I start answering the questions, I usually end up writing a few more pages beyond the simple answers. That may just be me, but I’ll bet if you try it, you’ll get similar results. And you’ll be writing. What was accomplished? As in, what did you do today? Took out the trash? Read a good book? Had some great coffee? Made a new friend? Whatever happened, write it down. It doesn’t have to profound or life-changing, it just has to be something (or somethings) that you accomplished that day. What should not be forgotten? Did something really great and memorable happen today? If so, write it down. Did your baby crawl for the first time? Did you get that dream job you always wanted? Did you get to spend ten minutes just thinking and dreaming? If you want to remember it and never want to forget it, write it down. Years from now when you’ve maybe forgotten this day completely, you can open the journal, read all about it, and remember. What’s coming up? What are you doing tomorrow? Next week? Next month? Are you taking a trip, getting a raise, adopting a baby or going on a blind date? Write it down. Are you looking forward to something? What do you want to be doing in a year? Or, it can be as simple as reminding yourself that tomorrow is trash day. Simple, right? Now all you need is a good notebook and a pen or pencil to get started. What are you waiting for? This entry was posted in Analog, Cool Stuff, Gadgets and tagged Blackwing 602, Creative, Daily Writing, Fountain Pens, Journals, mac, Macintosh, Palomino Blackwing, Paper, Pencils, Pens, Rhodia, TWSBI, Writing. Bookmark the permalink.